LAS VEGAS -- SK hynix, the world’s No. 2 memory chip provider, may ultimately expand into the non-memory semiconductor market by tapping into an emerging market for a variety of system-on-chips for autonomous driving, Park Jung-ho, chief executive officer of parent company SK Telecom said Tuesday. 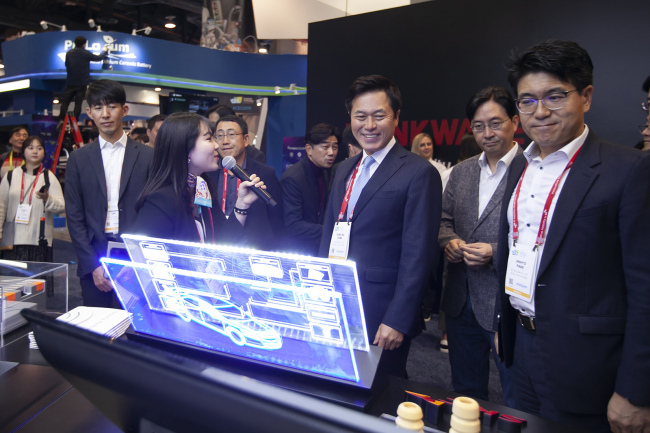 “SK hynix is (confidentially) conducting research and developing non-memory chips for vehicles,” Park told The Korea Herald after attending a press conference on SKT’s vision for future businesses in the era of the fifth-generation network at Consumer Electronics Show 2019 in Las Vegas. Park’s answers were part of a press question about his measures to newly evaluate SK hynix’s market value before an upcoming governance restructuring plan for SK Telecom this year. SK Telecom holds 20.07 percent of SK hynix’ shares. “In order to increase its market share for vehicle semiconductors, SK hynix is doing R&D not only for memory but also for non-memory,” he explained. According to IHS Markit, memory chips are forecast to account for a mere 8.2 percent of the total automotive semiconductor market this year. The company is seeking collaborations or strategic partnerships with fabless non-memory companies such as Nvidia, Park noted. As the chief of SK hynix’s parent company, Park has often spoken up about developments at the chipmaker subsidiary. Park has even spearheaded its participation in the acquisition of Toshiba’s NAND flash business in 2017. SK Telecom is set to divide up its current business units -- mobile network operator, media, comerce and security -- as independent subsidiaries and set up an intermediary financial holding company. Under the revised fair trade law, a new holding company must have a stake of at least 30 percent in its subsidiaries. Meanwhile, SK hynix declined to comment on Park’s remarks. SK hynix is participating in the Consumer Electronics Show for the first time this week, joining its counterparts from other SK Group affiliates. In the affiliates’ joint presentation for autonomous driving technologies and solutions, SK hynix is in charge of the memory chips for autonomous cars.